I upgraded Home Assistant to v0.62 at the weekend and my 433MHz switches stopped working. Odd though it might sound, that’s proved to me once again the benefit of open source software. So they’re my switches and for some reason they’re now triggering an error. I have other 433MHz devices – a doorbell and a weather sensor – and I checked to see if they were working. They were, so the issue was specific to the switches and not an overall problem with RFXtrx. If I was running commercial software that’s as far as I could’ve taken my investigation. The next step would’ve been to contact support, maybe raise a ticket and post on some forums. 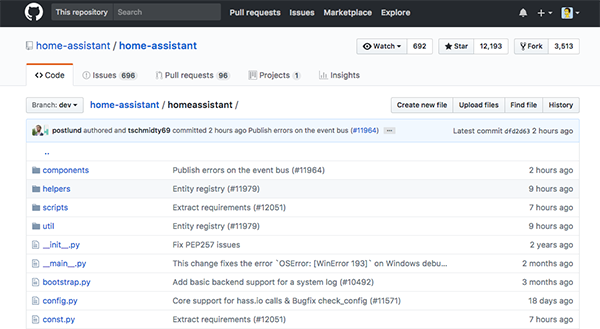 Home Assistant is open source, though, so I had other options – I had the source code. Being Python as well I had an easy way to install an older version. I’d actually skipped 0.61, so the last working version I had was 0.60. The issue was still present. I tested 0.60 again to confirm that it worked in order to rule out an external factor as the cause. It was fine, so I knew the issue was introduced in 0.61. """Return the RFXObject with the packetid.""" There it is. The ValueError that was triggering the exception in get_rfx_object. That did the job, the errors disappeared from the logs and my switches sprang back into life. So everything was working but that didn’t explain why it broke in the first place. When something breaks like that it’s good to know exactly why it broke. I did a bit of digging on Github to see the changes that had been introduced in 0.61. It turned out there had been a major tidying up of the RFXtrx code. There it is – in versions up to 0.60, the Home Assistant code in rfxtrx.py was adding a leading zero to ensure that the IDs were an even number of digits. It’s not really a bug. The older version was just more forgiving. You could argue that anything that breaks a previously working configuration is a bug, but the Home Assistant project never shies away from breaking changes if it makes for tidier code. The point of this little case study is that open source software gives you the ability to track down issues in a way that just wouldn’t be possible with commercial software. You don’t need to be an expert in Python to read the code – if you’ve done any programming in other languages you can probably follow what’s going on well enough. Even with my relatively limited experience with Python I was able to figure it out. I wouldn’t say I’m ready to jump in and contribute changes, but I don’t need to be. If the problem had turned out to be a genuine bug that needed a code fix, I would’ve been able to log a far more detailed bug report than would have been possible without the source code. Sometimes it’s only when you hit a problem and find a fix that you truly appreciate the benefit of the open source approach. Can you tell me what doorbell and weather sensor you are using as i’m in the market for a new doorbell one as my old one which doesn’t work properly is also not compatible with rfxcom.